A fascinating quest to solve a gripping sci-fi mystery. You can download The Fall of The Gods for free here. Like all other titles in the series, it is distributed under Creative Commons BY-NC-ND 4.0 licence. This means you’re welcome to freely download and redistribute this book in any format, but you can’t modify it, sell it, or credit someone else than me as the author. For more information, please check this page. This book is available for Kindle, in ePUB format,and as a PDF as well. For compatibility with older e-readers, multiple versions are available for some of these formats. Let me know if you have any issues with your version. 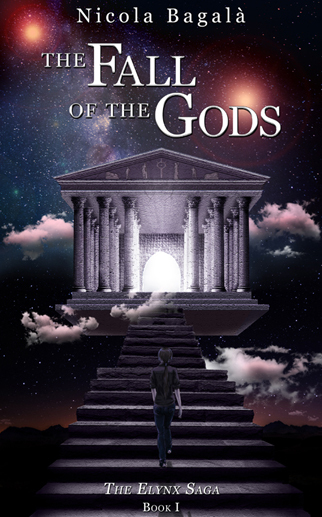 The Fall of the Gods - Kindle: This is the recommended version for most Kindles. If you have a recent Kindle, this is the version you want to download. The Fall of the Gods - KDX: This version is specifically designed for Kindle DX, which dislikes the way I implemented paragraph spacing in the version above. The Fall of the Gods - Kindle iOS: If your Kindle reader app runs on iOS, you need this version. The ePUB format is meant for readers such as Tolino or Nook, as well as ebook apps for Android, for example. The Fall of The Gods - ePUB v1: This is the recommended version for most modern ePUB readers. In case of problems, try the version below. The Fall of the Gods - ePUB v2: Download this version if you have an older reader or if it chokes on the paragraph margins of the version above. Several e-reader apps for Android tend to ignore text formating and paragraph margins, which can impair your reading experience. Should this happen, let me know, or try the PDF format instead. The Fall of the Gods - PDF: If you don’t have an e-reader or you prefer reading on your computer, PDF is the way to go. Odds are your computer already has a PDF reader installed; should it not, try Acrobat Reader or Sumatra PDF. They’re both free. If you’ve read the book and would like to express your opinion on it, email me your review. I will publish the reviews which I find the most interesting (not necessarily praising ones). If you like, you can include a title and a one-to-five star rating to your review. Please note that the reviews below aren’t necesssarily all those I ever received or that were ever published/cited elsewhere. When one of the world’s richest and most eccentric researchers disappears without a trace leaving behind a vast empire of scientific and technological advances; many interested parties look to investigate. Yet, years later there is still no trace of Edwin Deverex. Life moves on and the posh Deverex Tower is revamped to become a small cityscape bustling with various activity. Yuki Kashizawa moves to London to stay in the Deverex Tower while completing her Ph.D. in Mathematics, never suspecting that she would become entangled in an enigma that will cause her to question everything that she has come to understand. The story also follows the life of Ayleen, a woman who awakened in the middle of the desert, alone and without memories, found by the missing Edwin Deverex long before his disappearance. Ayleen is trying to piece her memories back together through lucid dreams as she struggles to come to terms with the unexpected disappearance of Mr. Deverex. The one who can provide the most information on the disappearance of Mr. Deverex is the character Hex. Hex plays a strong role near the middle of the story, which interestingly enough, would not have even involved Yuki if she had not been looking for more to life than completing her Ph.D. The various story lines blend nicely together and the story itself is greatly researched. Although the bulk of the description lends itself primarily to the sciences and description of technology, the action and combat scenes do not lack in story-telling quality. This is a shorter story, which is the first in the Elynx Series. By the end of the first book I found myself wondering where the author may take the second or further subsequent books. I found myself fascinated with the overall plot of the series and I look forward to future work by this author. I highly recommend picking up a copy of this book if you would like to experience an adventure outside of what we often consider normal! This book is a nice mixture of superheroism, mystery, sci-fi, mythology and a hint of comedy. The story flows very naturally and it was an effortless read. The story consists of several characters and every chapter progresses all of their stories which become intertwined together. This type of storytelling can be difficult but the author succeeded in this very well, keeping my interest up throughout the journey. I found the mythological aspect of the story extremely intriguing but this book only seems to scratch its surface - leaving us waiting for the next book with interest! "[...] I found myself fascinated with the overall plot of the series and I look forward to future work by this author. I highly recommend picking up a copy of this book if you would like to experience an adventure outside of what we often consider normal!" "[...] The author expertly crafted hyperreal feeling dreams. [...] The author did an amazing job detailing the mystical world and the story around Ayleen [...]"
"[...] The book was a great introduction to what looks to be a great saga!" Copyright ©2016-2017 Nicola Bagalà. Some rights reserved. All third-party badges and logos appearing on this website are copyrights and/or trademarks of their respective owners.